It is possible that the camera has now actually been uninstalled. I let it run most of the day the day before yesterday but I didn't see anything worth mentioning except the dove. The buzzards are for my feeling too little at the nest to be really interested. But it would have been funny! Unfortunately also hardly a WTE is to be seen or heard. I ask myself - where are they? Yes, lately no sign of our eagles at all, thats unacceptable. Its always fun and curious to see other bird species visiting the nest, but nothing will ever cheer my heart more than white tailed eagle. This season its unfortunate. I wonder which bird this nest belongs to, is it Spotted Eagle? Crissi, I go with you ❤ and I would like to ask anyway whether the nest of our WTE has a new chance. If it will be online again at the right time. I hope Urmas reads along. I am open for all observations but I think it is also a matter of the heart that we open our special cameras every day. Every nest will find its friends but I think sometimes less is more. It would be more effective, more educational. It is not our decision and I remain grateful for my moments that I can follow our nests but another new nest would only irritate me. And of course - the men do a good job. You shouldn't praise men too often but - it's great that they share their time for our mysterious and beautiful nature with us! Yes, it should be Spotted Eagle, as Urmas writes. But Greater or Lesser spotted Eagle? Surprise - surprise? WtE nest here gave interesting insights though, e.g. with the Eagle Owls, rare species in Estonia. 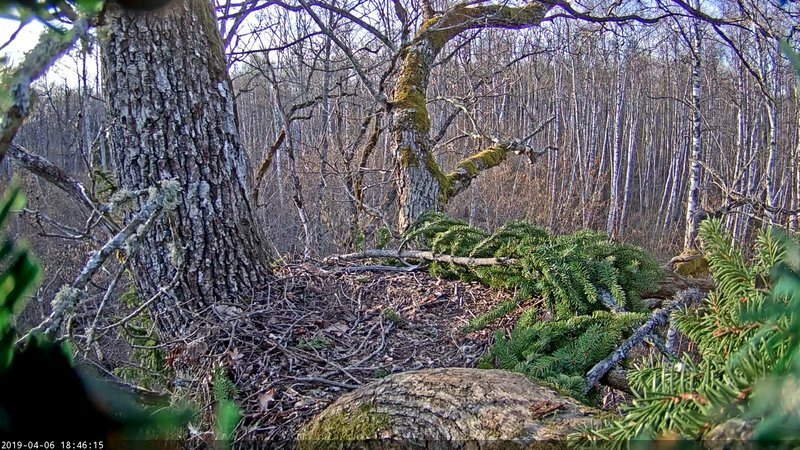 Buzzards were already "Bird of the year" in 2015, with several cams. I can understand that the decision fell to change over to an other nest. Sorry for sending you only few information about moving a camera! Actually we did not know, what will be next day - buzzards, if really started to breed, might change the plans, but they did not. With few cameras seems better to take maximum of them, anyway everything in hardware changes quick and soon we need to change the equipment to be relevant. Not always is possible to change position, though. 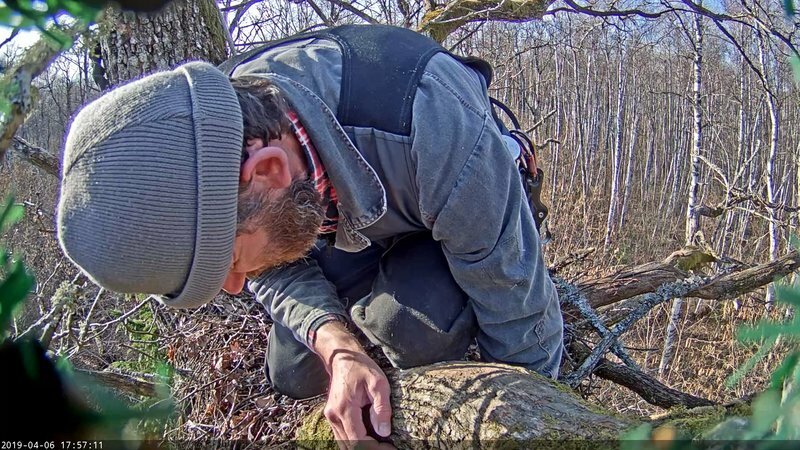 We planned to install this cam on Greater Spotted Eagle (as the rarest a most endangered here), but eagles were present yesterday there in nest territory, so we skipped that plan. As we were in western Estonia, we looked for Lesser Spotted Eagles sites (those eagles still on way back) and finally that oak nest was equipped. It is quite typical deciduous forest type for western Estonia in state forest. Techno Urmas will change link from merikotkas to some other (will let you know if happens). During installation it was not planned to show stream, but it happened so. Other guys (Omar and Renno) installed solar panels, therefore I had some time to rest till they finish. So White-tailed Eagle season in over, but we left some equipment there for case if eagles occupy that nest again. Other guys (Omar and Renno) installed solar panels, therefore I had some time to rest till they finish. Let it be granted you from the bottom of your heart. Even if it was just an oversight - I think it's nice to see the people behind this great project. You sacrifice a lot of time and effort and do a great job! Thanks for that! Good luck with the new nest! yes many thanks to all the team who provide us with all these wonderful nest cams. I had already looked. And the link didn't work either. so i decided to keep this topic open after all. it will not hurt anyone if it is not used. let's hope that the camera will be lucky on its new location at the LSE nest. Ame, that is sweet idea Thanks!